This is how you win the future. I’ll admit it, I’m kind of obsessed with Charlie Sheen right now. Like most of America, I can’t turn away from his many TV appearances, but unlike most of America, I feel awful about the entertainment value I’m getting for this. Still, I’m not going to pretend that Charlie Sheen’s quotes aren’t the greatest thing ever and that Charlie Sheen quotes make everything funnier. 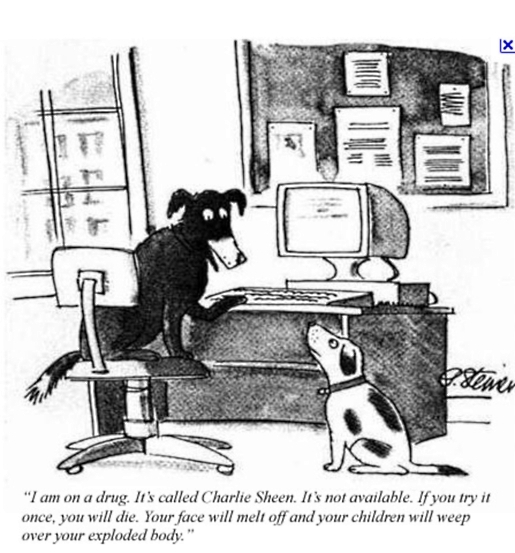 For example, Charlie Sheen quotes have been used to recaption New Yorker cartoons. It’s pretty much the best marriage of surreal words to odd cartoons since Gary Larson retired from the comics grind. This, like the Sheen Dream website, is another great way to use Charlie Sheen’s words for maximum entertainment value. As a bonus, New Yorker cartoons finally make sense to me! Even better, they’re legitimately funny! It’s like the perfect marriage of deliberate crazy and attempted crazy, and I don’t think I can get enough of these things. They’re really all spectacular, so check them out. I just hope these things keep coming, because I want more.